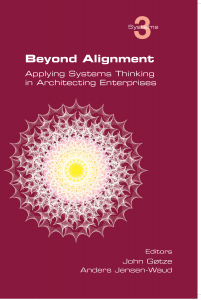 I am pleased to announce that our new book, Beyond Alignment: Applying Systems Thinking in Architecting Enterprises (ISBN 9781848901162) is now available via Amazon.com, and should be available internationally any day now. The book is a comprehensive reader about how enterprises can apply systems thinking in their enterprise architecture practice, for business transformation and for strategic execution. The book’s contributors find that systems thinking is a valuable way of thinking about the viable enterprise and how to architect it. The contributions to the book have been collected over the past couple of years and continuously been edited by authors and editors. As the Danish poet Piet Hein said, T.T.T., Things Take Time (Ting Tager Tid). We hope you will enjoy the result.